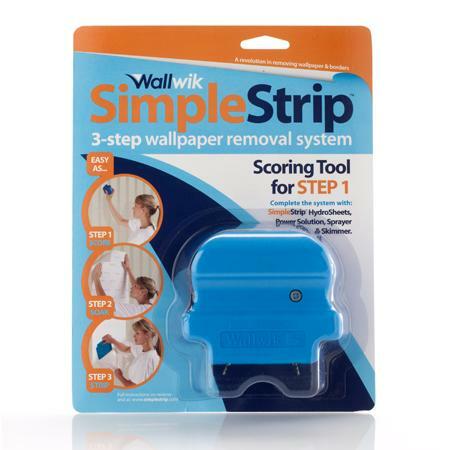 Product description: The heavy duty SimpleStrip Scoring Tool is ideal for scoring all types of wallpaper. It creates thousands of tiny perforations, allowing the HydroSheets, to re-hydrate the old paste. The scoring tool can penetrate single or multiple layers, without damaging the wall itself. The hardened steel teeth remain sharp for many rooms of wallpaper removal. How to use: Make strokes approximately half an inch apart in a tick-tack-toe pattern. The greater the number of holes you make, the easier it will be to rehydrate the paste and remove the old wallpaper. For multiple layers of wallpaper, carefully apply more pressure, piercing through each wallpaper layer except the last layer.